I have some good news to share, I'm rehoming Santina. It's a hard thing to talk about so I'm glad I got that off my chest. Read till the end and watch the video to understand the situation, how the rehoming went, and how a win/win situation came out of it all that really is good news. I adopted Santina from the rescue on December 23, 2013. She's been a great bird and a wonderful pet. However, from early on we ran into issues. I'm not talking about behavioral ones because those we solve through training. I'm talking about Santina's health problems. From the beginning, it was clear that she had some issues, but I was optimistic that veterinary medicine could cure her. I spent a small fortune getting Santina tested for everything under the sun, yet the results were inconclusive. It was a wild goose chase because results would contradict each other and no specific cause could be found. I treated Santina with antibiotics and kept her quarantined from Kili & Truman for triple the normal quarantine period. In the absence of a specific diagnoses and under the impression that the treatment helped, I went ahead and put all of the birds together. It wasn't long until Kili and Truman began exhibiting similar symptoms to Santina. It was not clear at first because they were all close together. But as Marianna started borrowing birds for a few days at a time, in the isolation of her room, she discovered that Kili & Truman had the same things going on. All the birds went on antibiotics. While on medication, things would seem to improve. But, once off, things would go right back to before. Marianna moved in with her Blue and Gold Macaw, Rachel. Rachel got sick too which made things even more clear. We started by keeping Rachel in a cage in a separate room and treating her. Over the course of the last two years it has been a nightmare of juggling treatments and quarantines. We went so far as keeping each bird in a separate room and showering between birds. This has led to a few things. First of all, it led us to discover that antibiotic treatment appears to cure all of the birds but Santina. After several different medications and a long trial of isolated treatments, we have concluded that Santina's condition is most likely incurable. The curable bacterial infections that she has been spreading to the other birds may be a symptom and not the cause. When removed from Santina's presence, after a course of antibiotic treatment, the other birds have been infection free going on for over half a year. 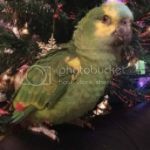 The other thing we had come to realize was that Santina's condition has been taking a toll on our bird and family life. Instead of focusing on making new training videos, taking the birds places, writing articles, and doing the sorts of bird things I usually do, I have been plagued with vet visits, quarantines, and depression. We could not travel with multiple birds, could not keep the birds together as a family, nor spend time with more than one bird at a time. The wedding was a distraction and kept us busy. We had to jump through hoops to make arrangements to get the birds involved in the wedding without impacting their quarantine. Since the time I introduced Santina to the other birds, my entire bird life has become stagnant. I stopped training Santina because I was afraid to risk her illness becoming worse. The other birds, I could not get to training because much time was being spent on work and handling all of the birds separately. Marianna has made all of the quarantine efforts possible by splitting the tasks of caring for each bird. Life had become a rut. There was no motivation or pleasure from doing bird stuff and thus a giant set back in the online realm as well. We never planned things to go on as long. It always seemed like there would be an end in sight. First it would be a week of medication, then two, then a month. When we split the birds into different rooms, it was just going to be a trial to see how they do separately. But, weeks turned to months and months to years. Nothing was changing. We were exhausting all ideas and possibilities. The conclusion was becoming more and more apparent that Santina would not be able to be kept together with the other birds. All of the birds were short-changed throughout the whole process. Instead of spending one collective time taking care of them all, time had to be spent on separate feedings, separate cleanings, and quarantine procedures. Although more time was being spent on birds than the normal situation, individually the birds were receiving less time. What started as a health problem and temporary solutions was turning into a long term problem. We were getting nowhere. This summer, I was contacted by a lady that had seen my picture used in a bird sale scam. These things happen left and right and there's nothing I can do about them (most of them are overseas and create a new page every week). She was looking to get a Green-Winged Macaw. We got talking and before long, Lori and my wife became great friends. Lori read my book, The Parrot Wizard's Guide to Well-Behaved Parrots, and discussed the finer points of owning macaws with Marianna. Lori was still trying to decide if a Green-Wing was right for her or not, so Marianna and I paid Lori a visit with Santina. After meeting Santina, Lori told us she would like a bird just like her. Coming home from that visit, we realized that there was a strong potential here for an ideal situation all around. 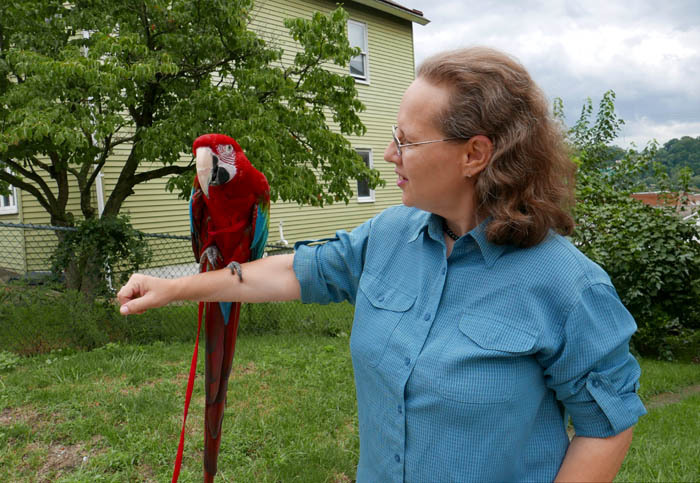 We stayed in touch with Lori and helped her develop her understanding of parrots. Then there came a point where I asked Lori if she would be interested in adopting Santina. She was ecstatic beyond words and the answer was yes. Lori is the ideal candidate for adopting Santina. Lori has a house but no other people or parrots living there. She can afford the upkeep for a macaw which is quite expensive. She loves animals, has time on her hands, and has no plans for adding any other birds. She is patient and willing to follow the training methods for developing trust. Also she is willing to give up an entire room in her house to give Santina the lifestyle she has become accustomed to. Likewise, Santina is just the kind of birds that Lori was looking for. We spent the rest of the summer making preparations for the rehoming process. There was no rush to get it done and no deadline. However, due to conveniently overlapping summer schedules, it worked out to be easier to do things more quickly than to wait for the fall. It just so happens that the more you are willing to take your time, the more quickly things end up actually happening. 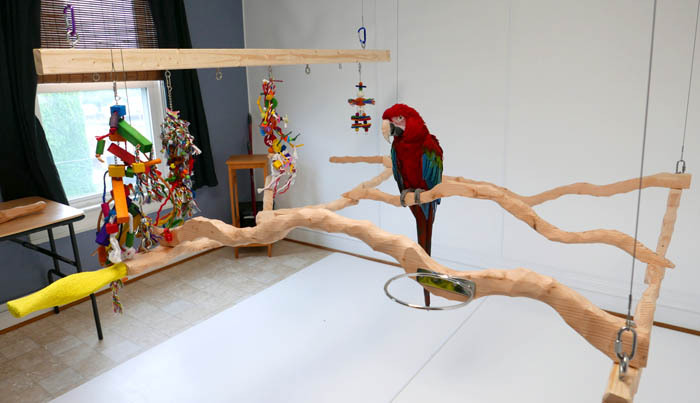 Lori put up plastic sheeting on the walls, replaced the flooring with vinyl, repainted the ceiling, removed all loose wiring, and prepared the room to be bird safe. It was a lot of work but best done before having a bird in the home. 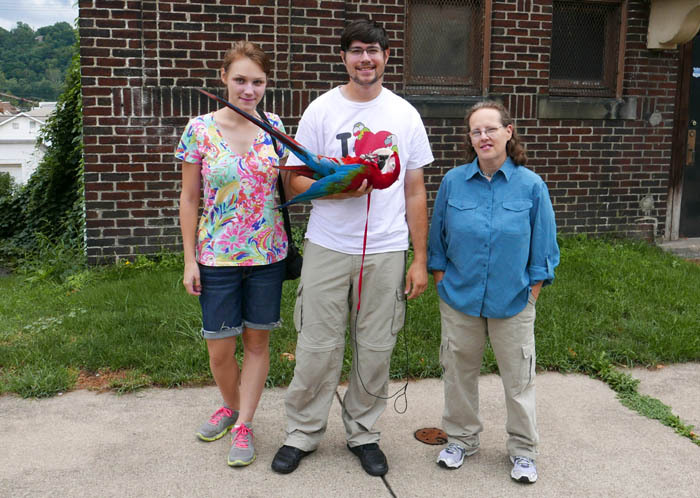 We took another trip to Pittsburgh to help Lori prepare the bird room for Santina. We built a custom NU Perch stand and hung it from the ceiling. Also, the ceiling light was upgraded to a bright LED fixture and the light switch was replaced with a timer. We brought over some of Santina's old and new toys so that things would be as familiar as possible. We even used her old food bowls and Training Perches. The room was ready but there was one more thing to prepare: Santina. Santina is a great bird with people she is familiar with but can be a menace to anyone new. I've done a fair bit of socializing her over the years, particularly using the Aviator Harness to take her outside. However, Santina still would not be at the point like the other birds to just step up for someone else for sure. There was no way I could fully prepare Santina for the exchange. So instead I focused on preparing Lori and Santina for the training process to build a relationship. I spent time reminding Santina of the training exercises I had already done with her initially to teach her to be good with me. I wanted them to be fresh in her mind so that Lori could use them. I emphasized target training and stepping up onto a handheld perch so that Lori would be able to use those tools to move her about in the first few weeks without contact. I also spent a lot of time talking to Lori about the steps to follow to win over Santina. To put it simply, don't try to touch her or force her to step up, use the training tools she knows to relearn to do those things for you. On August 21, 2016, nearly 3 years since adoption from the rescue, I rehomed Santina. I flew Santina out to Pittsburgh to see Lori again. Santina seemed to recognize her and was in a great mood. We moved slowly in the introduction stage and Lori did a great job. I know it took effort to hold back some of her excitement but in reality it made things go much more quickly than expected. We stayed the weekend and got to witness progress in the making. Santina went from just barely taking treats from Lori to jumping on a Training Perch to get treats from her. Santina was becoming more at ease with Lori's presence. Otherwise, Santina was perfectly at home on the familiar NU Perch stand I built her. We practiced Santina's feeding/cleaning routines a few times with Lori doing it more and more on her own. Although the rehoming process only lasted two days, it felt like weeks of progress because we made a gradual transition. Santina had the chance to get used to her new home and new owner with me around so she actually felt quite at ease. We would leave to go get lunch, then come back and work with her. Then we would go out for dinner and come back. This coming and going got Santina more relaxed, and when I left without coming back, she already had a new friend in Lori. And this is really great news. Santina has been taking to Lori very quickly. They have a wonderful understanding and connection developing. Lori adores Santina. The dedicated passionate attention that Santina is receiving is definitely uplifting to her. Santina was always a one-person bird before. She grew up as an only bird and I have found her to like attention as an only bird. The group environment was not ideal for her and she did not deal so well with the little green guys buzzing around so much. On the other hand, with Lori, Santina can be the center of all attention. As I left Santina with Lori, I was actually quite happy. Certainly there was a feeling of sadness in going home without her. However, seeing how well she is doing with Lori and how happy Lori is to have her, I knew it was all right. Kili, Truman, and Rachel are for the better. They will be able to recover their health and get back to training. Santina will be in a home environment that she actually enjoys best. 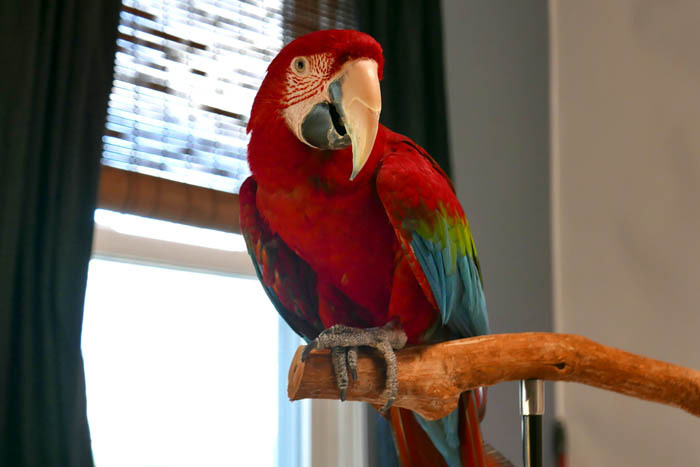 Lori got the exact kind of macaw that she was looking for. And Marianna and I have a wonderful new friend. This just goes to show that a rehoming situation, when done right, can have an all around happy ending! I am glad you were able to have such a good rehome for Santina. Sounds like it will be the best for every being involved. We wish all the best for Santina and Lori. I feel sad for Santina in one side. She really had a deep bound with Michael. I am sure Lori will do her best, but the dogs frighten me a bit. Also dogs and Santina all needs care and attention, Santina's situation now still not one person-one bird. Hopefully Lori will handle all very good. I watched your video and had a read through that.I had no idea you had to go through all that and I was wondering why you weren't uploading much videos. I wonder if stress from being uncomfortable around other birds could have been contributing to her repeated infections? It's always sad when a bird has to be rehomed, but it looks like you did what was best for her. Time will tell, I guess. I hope everyone ends up healthier now. I shared the video with a few people who knew Santina when she was Santino. They're all glad she is doing well. Santino was before my time, but I know I miss and remember all the birds for whom I helped care. [quote="Navre":26t6jv14]I wonder if stress from being uncomfortable around other birds could have been contributing to her repeated infections? [/quote:26t6jv14] It is possible and something we have considered. The worst she had been was around the time Marianna/Rachel were introduced. It wasn't until she was isolated that she was starting to do better but she was being shortchanged on time because attention had to be divided four ways. Just can't be sure if it was a factor or a coincidence. Gaugan my Red Belly does best with another parrot around who accepts her as the bossy little being she is, otherwise she overbonds to me and is nasty to everyone else. Having Sunny the Meyers around keeps her busy making sure she has a strong bond with the whole household, and she is happier that way. Since they are cousin species they have similar body language and can understand each other easily. I have such a happy household of everyone getting along right now I am very hesitant to add another. The large species all need to have their own human and sharing him/her is stressful to them so I am sure that Santina will do much better now with her own human in attendance all the time. I am sorry you had to rehome her, Michael, but, sometimes, we are just a stop in their lives. I am surprised the rescue where you adopted her did not have a clause on their contract forcing you to return her to them though - it seems to be a default clause in all adoption contracts nowadays.